Here are 4 free online keyboard test websites to check all keyboard keys. This is an easier way to check if all keys on your keyboard are working fine. A QWERTY keyboard layout will be in front of you and you need to press keys on your keyboard and the pressed key is highlighted with green or some other color. This indicates the key is fine. Some of these online keyboard test websites also let you test mouse buttons. Apart from that, you can also enable/disable sound when a key is pressed. This will also work as an indicator that the key you pressed is fine. You don’t need to sign up to use these websites to check all keyboard keys. Simply open the homepage of any website and start the keyboard test. Let’s check these free online keyboard test websites one by one. 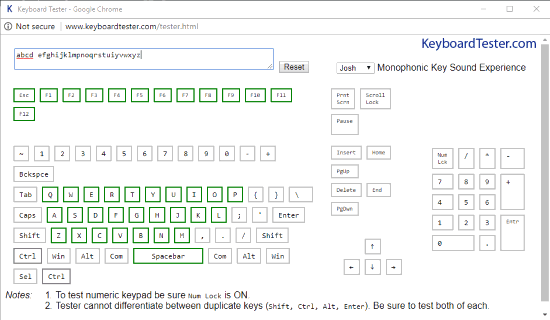 Keyboard Checker (Homepage) is one of my favorite online keyboard test website. I like its interface a lot. Apart from checking if all keys are working fine, it gives some other useful options. It shows how many keys you can still press (after pressing some keys) and what was the last pressed key. You can also hide/show numpad from keyboard layout anytime with a click. When you press a key, it is indicated by green color. Other keys are visible with the default white color. This keyboard test website can’t help you check ‘Function (fn)’ key but rest of the keys including numpad can be checked easily. Key-Test (Homepage) comes with a beautiful keyboard layout. You press a key, it will show that key in cyan color and when you release the key, the appearance of that key on keyboard layout is visible with white color. The pressed key is also visible on the top part of its interface. Apart from checking all keyboard keys, this online keyboard test website also helps to check mouse buttons. You can press left, right, and middle mouse buttons and it will indicate them on its interface. KeyboardTester.co (Homepage) also comes with keyboard tester and mouse tester features. Its keyboard tester provides an attractive keyboard layout where all keys are present (including Numpad). There is a text box available which lets you see the keys pressed by you. The keyboard layout marks the pressed keys with green color and some keys (like Shift, Alt, Ctrl, etc.) are visible in other colors. You can also reset the keyboard layout to remove all the marked keys and begin keyboard test from scratch. An option to enable/disable keypress sound is also present that you can use as per your requirements. KeyboardTester.com (Homepage), the name gives a very good hint about the working of this website. This is a very simple keyboard test website which gives a basic keyboard layout and a box where you can see the pressed keys (only alphabets, numeric keys and not arrow keys, Print, Scroll keys, etc.). From numpad to home row, upper row, lower row, middle row, Print key to delete key, all keys are present. On the homepage of this website, you need to press “Launch The Tester” button and its interface is opened in a separate window. When you press a key, it is indicated by red color and when you release a key, that key is marked with green color on the keyboard layout. That means the key is working fine. You can also enable sound for pressing the key which will also help to identify the key pressed is working. If you want to check keyboard keys using some software, then you may check this list which covers best free keyboard testing software. I find all these online keyboard test websites pretty useful to check keyboard keys. Still, for me, Keyboard Checker (the first website) is better than others. Its interface, option to find which key was pressed last and toggle numpad from keyboard layout are interesting. You may give a try to all these online keyboard test websites and share your opinion using the Comments section.